Florentine painter. 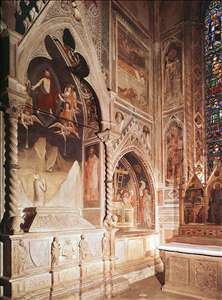 Almost nothing is known of his career (Vasari does not mention him), but he is regarded as the greatest of Giotto s pupils and followers on the strength of Ghiberti s testimony that he was the painter of the frescoes illustrating the legend of St Sylvester in the Bardi Chapel of Santa Croce, Florence. Maso is mentioned in connection with the Bardi family in a document of 1341. It was a member of this family that provided for the foundation of a chapel bearing the family name. The Bardi di Vernio chapel in Sta. Croce was largely decorated by Maso di Banco. 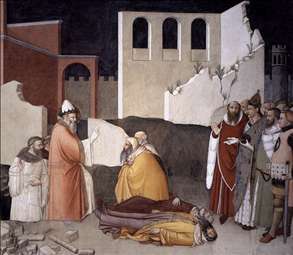 The frescoes representing five scenes from the legend of St Sylvester possess clarity of design and harmony of colour. The stately figures here are sometimes even more massive than Giotto s and the lucid and beautifully coloured compositions are of almost geometric clarity (although it has been argued that some of the effect of monumental simplicity may be due to restoration). 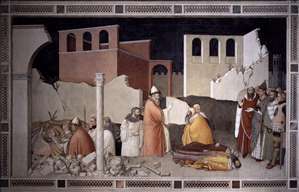 The architectural settings and figures in the St Sylvester Resurrecting the Ox and St Sylvester Resurrecting the Two Magi Killed by a Dragon anticipate the monumental style of Masaccio and Piero della Francesca. On stylistic grounds other works have been attributed to Maso, including panels in Budapest (Museum of Fine Arts), Chantilly (Muse Cond), and New York (Brooklyn Museum and Metropolitan Museum). See more details about "Pope St Sylvester's Miracle"
See more details about "Pope St Sylvester's Miracle "
See more details about "Tomb with fresco of the resurrection of a member of the Bardi family"